India’s largest retail chain for Furniture and Home interiors, StyleSpa, today at a press meet unveiled their new range of bedroom furniture “Cove”. The product was launched by Mr CM.Satheesh Kumar, Senior Vice President – Operations. “It gives us great pleasure to be introducing yet another outstanding Bedroom Range in the region. The new “Cove” range is all about functional excellence and value. We are announcing an inaugural offer to our Kerala customers. They can now purchase the COVE Bedroom Package at Rs 39995 which includes a Queen Size Cot (150”)* along with a three door premium cupboard with mirror and a bed side storage table. The company is also giving an entertainment unit with shelves worth Rs.5995 free with this package which is almost 51% discount for people of Kerala specially for this ONAM.” he added.“With over 115 stores already spread across 67 cities and towns, we are looking to strengthen our reach through initiatives like large format Flagship stores and also are expanding through Franchise model. The Pan-India presence also helps us to deliver anywhere in India and provide efficient after sales service which is a huge differentiator between us and others in this category. 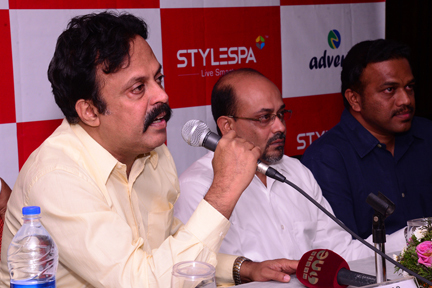 To support and compliment these initiatives,StyleSpa has recently introduced an e-commerce platform where customers can check out / buy our entire product range.” shared Mr. Mahesh, GM: Sales & Marketing. The Cove designs are ergonomic and come with a tilted back-rest. They have reinforced support for inclined back-rest. There is a Cove Inlet in the back-rest for bedroom essentials. The furniture is a double walled structure for durability. There is an outer panel to enclose bed and toe protection. Cove range has a large under bed storage which would ensure cleaner bedroom. The ‘ADVENTZ’ Group is an Indian conglomerate that’s partnered by world leaders in various areas of enterprise and has significant presence in agriculture, engineering & infrastructure, real estate, consumer durables and services.The USD 3 billion Group led by Mr. Saroj Kumar Poddar comprises 23 companies in various verticals. It is a major producer of a wide range of high-quality complex fertilizers and other agricultural inputs such as seeds, pesticides, micronutrients and speciality fertilizers. Stylespa / Zuari furniture is one among the many companies of the Adventz group. Backed by one of South Asia’s largest factories specializing in producing panel based furniture,every piece of Style Spa furniture is built to exact technical and aesthetic specifications. This technology set up is the largest of its kind in Asia. IFPL has a design team that has been trained in Europe. These expertise have helped IFPL bag prestigious projects from corporate and institutions such as Reliance Industries, Ernst & Young, Schwings Stetter, Chambal Fertilizers, IIT Kanpur, IIT Bhubaneswar, ISM Dhanbad, BITS Goa, IIM-Calicut, Lancaster university UK, Walmart US, Tata-Fiat, Paradeep phosphates etc. Zuari Furniture, our other brand from the Adventz group which has over Over 800 dealers and 60 distributors through the Distribution network and have a healthy presence in many stores in Kerala.